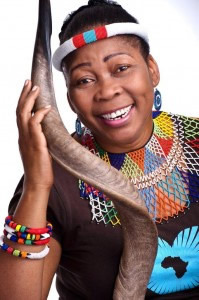 Nokugcina Elsie Mhlophe was born in 1959 and is well-known for her roles as a freedom fighter, activist, actress, storyteller, poet, playwright, director and author. Storytelling is famously a deeply traditional activity in Africa, and Gcina does exceptionally well. She is one of the few women storytellers in a country largely dominated by males. 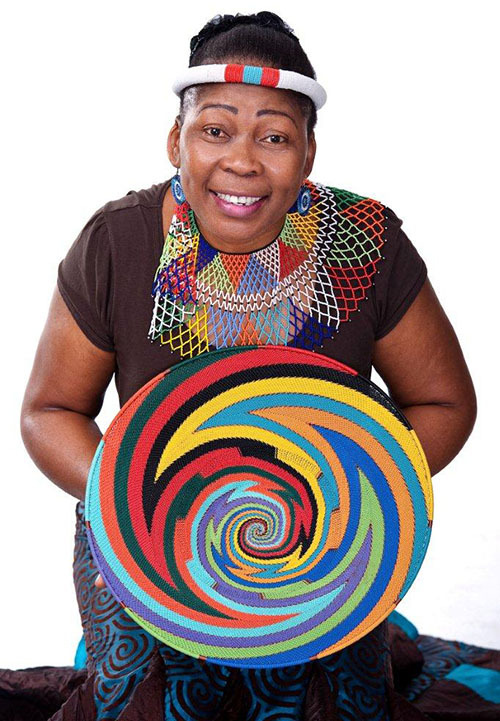 Gcina does her most important work through charismatic performances and works to preserve storytelling as a means to keep history alive as well as encourage South African children to read. 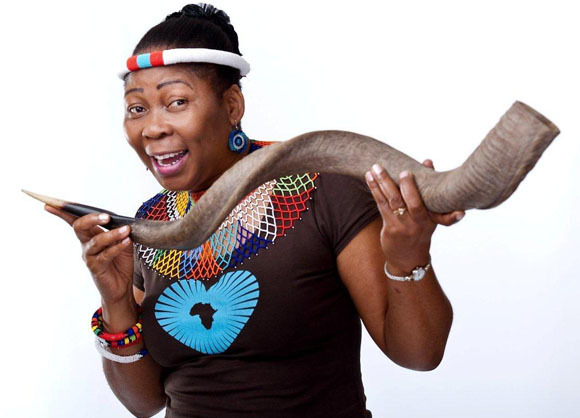 Gcina delivers her stories in four of South Africa’s languages, English, Afrikaans, Zulu and Xhosa, which makes it possible for South Africa’s people to receive her stories in a language that can be understood by a diverse majority. Gcina was born on the 24th October 1958 in Durban, South Africa and speaks five languages, Zulu, Xhosa, English, Afrikaans and Sotho. She matriculated at the Mfundisweni High School in 1979 and participated in a Cadet Journalism course at the Rhodes University as well as partook in a six-month film making course as part of the Interchurch Media Programme’s community project. 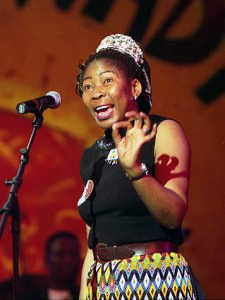 As a journalist, Gcina held a part time news reading position at Press Trust, Africa Service and between 1982 and 1983 she was writing for the Learn and Teach magazine. 1983 - Gcina was the lead actress in Umongikazi – The Nurse by Maishe Maponya, in which she toured England, Ireland, Holland and Switzerland. 1984/85 – She acted in the workshop play, The Black Dog – Injemnyama, directed by Barney Simon, in which she toured South Africa. 1985, 1987 and 1989 - she wrote and acted in the autobiographical piece, have you seen Zandile, in which she toured South Africa, Lesotho, most of Europe and participated at the Edinburgh Festival. The piece was mounted as a Visiting Director at the Chicago Theatre Co. and at Knoxville’s Carpet Bag Theatre in Tennessee with different US actors, who later went touring the USA. 1986 - Acted in the workshop play, Born In The RSA, directed by Barney Simon, touring South Africa, England, most of Europe and the US. Participation at the Edinburgh festival. 1987 - Visiting assistant director with Barney Simon at Boston’s Brandeis University, work-shopping and staging the musical play, Written By Hand. 1989/1990 - Resident Director at the Market Theatre, Johannesburg. Co-writing and singing in the musical Inyanga, directed by Barney Simon. Writing and directing Somdaka, touring Johannesburg’s Townships and Zimbabwe. 1998 - Wrote and performed in the one woman show Love Child, by Mannie Manim Production. Took it to Japan to the Solo Festival in Tokyo. 1987 - OBIE Award as best actress in Born in the RSA – New York. 1987 - Fringe First Award for best production of Have You Seen Zandile – Edinburgh Festival. 1988 - Joseph Jefferson Award as best actress in Have You Seen Zandile – Chicago. 1988 - Sony Award nomination for best production of Have You Seen Zandile – BBC Radio Africa. 1986 - Lead Actress in Place Of Weeping, directed by Darryl Roodt and produced by Anant Singh. 1988 - Lead Actress in Palesa, written and directed by Elaine Proctor. 1990 - Acting, telling stories and performing poetry in the documentary Songololo, directed by Marianne Kaplan, Canada. 1992 - Acting and narrating in the documentary Traveling Songs by Lindy Wilson. 1995 - Narrating in the documentary Prisoners Of Hope by Danny Schechter, USA. 1998 - Nine part storytelling TV series Gcina and Friends for SABC, produced by Endemol, sponsored by JOKO, Unilever. 2002 - Ten Part History series for Television Looking Back, Moving Forward for SABC Education. 2005/2006 - Presented Traditional Music Program Zindala Zombili on SABC Television. 2007 - Narration for the Internationally acclaimed Angolan Documentary Film, SAUDADES, From the One Who Loves You. 1979 - Poetry in the Staffrider Magazine, Ravan Press. 1980 - Story and Poetry in Reconstruction, Ravan Press. 1981 - Story and Poetry in the LIP – Anthology, Ravan Press. 1987 - Story and Poetry in Sometimes When It Rains, Pandora Press, UK – Translations into German and Japanese. 1987 - Stories in Somehow Tenderness Survives, Harper and Row, USA. 1988 - Have You Seen Zandile? Play script, Skotaville Publishers, SA – Prescribed set work at the University Natal, University of Western Cape and UNISA, Republished 1991 for world release by Heinemann publishers, New York. 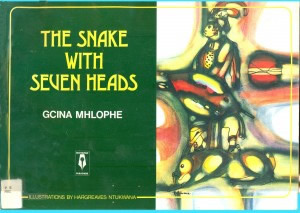 1989 - Snake With Seven Heads, children’s book, Skotaville Publishers, SA – Translations into five African languages. Accepted in the schools libraries. 1990 - Queen Of The Tortoises, children’s book, Skotaville Publishers, SA. 1991 - Molo! 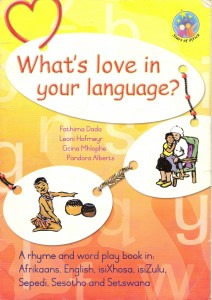 Zoleka, children’s book, published and translated into four different South African languages by David Philip, SA. 1992 - The Singing Dog, children’s book, Skotaville Publishers, SA. 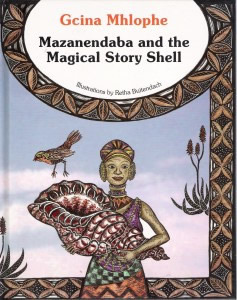 1995 - Ma Zanendaba – A Mother’s Search For Stories, children’s book, published in English and Afrikaans by Knowledge Unlimited, SA. 1995 - Story in The River That Went To The Sky, Kingfisher Anthology of African folklore, England. 1996 - Love Child, Biographical Work, Peter Hammer Verlag, Germany. 1997 - Kwesukesukela – Stories from Africa in five languages pubished by Bona Magazine. 1997 - Awarded writers’ fellowship at the Civitella Ranieri Center in Umbria, Italy – work on the children’s musical Mata Mata. 1999 - Fudukazi’s Magic, Cambridge Univ. Press, this comes with CD and Video made in 2001 – Karl Becker of GM Storyworks. 1999 - Recorded and released Kwesuke-sukela a storytelling audio tape that went with a book containing twelve of my stories, Stories From Africa or Zimnandi Ngokuphindwa in Zulu and Xhosa, sponsored by Joko Storytelling project. 1999 - Published children’s book NALOHIMA – The Deaf Tortoise by Gemsbok publishers NALOHIMA also won the Namibian Children’s Book Forum Award only a month after its release. 2001 - Nozincwadi – Mother of Books, Maskew Miller Longman, with CD and Video by Karl Becker as part of the Nozincwadi Road Show to promote reading in South African schools. 2002 - English edition of Love Child has come out – Univ. of Natal Press. 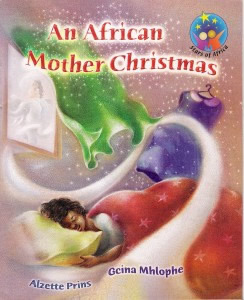 2002 - An African Mother Christmas, Maskew Miller Longman. 2003 - Stories of Africa, University of Kwa Zulu Natal Press Nominated for Exclusive Books Publisher’s Choice. 2003 - Conception and writing of the multi-lingual books for First Words in Print – Centre For The Book, Maskew Miller Longman. 2004 - Five early learning books in indigenous languages for Siyakhula Series, Oxford University Press (due for release in 2005). 2004 - The Story of Mazanendaba published in Italian by Corraini Publishers, Mantova, Italy. 2006 - Nozincwadi, Mother of Books was published to great acclaim in South America in Portuguese. 2008 - Our Story Magic published by University of Kwa Zulu Natal. 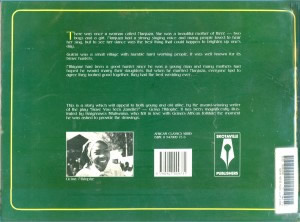 2009 - African Tales published by Barefoot Publishers in England. 1994 - Bookchat Award for Molo Zoleka!, BC Magazine, SA. 1991 - NOMA-Awards Nomination for Queen Of The Tortoises. 1994 - Honorary Doctorate for Literature by the London Open University, England. 1996 - Carl Lohann Award for children’s books. 1998 - Honorary Doctorate for Literature by the University of Natal, RSA. 2004 - Award for Life Time Achievement in Contribution to Traditional Arts. 2004 - Nominated for the Astrid Lindgren Memorial Award, Sweden. 2009/2010, SAMA Award for Songs and Stories of Africa CD. 2010 - EThekwini Living Legends Award, Dept of Arts and Culture, Kwa Zulu Natal. 2010 - Lifetime Achievement Award, Arts and Culture Trust, RSA. 2011 - Award for Contribution to Arts in Education, by Dept of Education KZN. 1988 - Performing poetry in a one woman show during the international Women’s Project Festival, New York. 1988 - Conducting storytelling workshops and performing in local libraries and at schools. 1989/90 - Conducting storytelling workshops at teacher training colleges and directing performances. 1989 - Co-operating with the READ Education Trust on several of their literacy projects. 1989 - Workshops in dramatising and choreographing stories with the Cape-Town Jazzart Dance School. 1989/90 - Organising two national storytelling festivals with the Market Theatre. 1990 - Performing Stories and Poetry at the Werkstatt III Festival in Hamburg, Germany. 1990 - Directing and performing in Storytelling productions at the Grahamstown Arts Fes tival and the Schools Festival. 1992 - Founding and directing the storytellers’ organisation Zanendaba, Johannesburg, SA. Since 1992 Touring and performing in South Africa, Kenya, Malawi, Germany, Switzerland, Canada, England, Netherlands, Australia and others. 1992/93 - Teaching as a visiting lecturer at Natal University/SA; Kyoto Syka University/ Japan and Edge Hill, Lancashire/England. 1994 - Releasing Gift Of The Tortoise with Ladysmith Black Mambazo – a children’s songs and stories CD, Music For Little People, California, USA. 1994/95 - Storytelling to raise awareness about endangered animals at the Easter Rand Show, commissioned by Nedbank. 1994/95 - Workshop performances with the London Philharmonic Orchestra in UK and SA. 1995 - Creating and performing stories for the London Royal Academy Of Arts in connection with the Africa 95 festival exhibition. 1995 - Keynote speaker at the IDEA 95 International Dramatists’ Congress, Brisbane, Australia. Since 1995 motivational talks for Liberty Life, DION, Eskom, Juicy Lucy and others. Since 1995 weekly storytelling on Radio Zulu and Radio Xhosa. 1996 - Storytelling tour and promotion of the book Love Child in Switzerland. Since 1996 Consultant for JOKO on their African languages programme. 1997 - Performed at the Durban Poetry Festival hosted and organized by the University of Natal, SA. 1997 - Participated in the Würburg Afrika Festival and toured Germany. 1997 - Toured France with storytelling performances and workshops held at public libraries. 1997 - Lectured at the University of Bergamo. Performed at pubic schools in Milan, Italy. 1997 - Release of the CD der welt erzählt (the world tells stories); an anthology on storytelling by die Erklärung von Bern und dem Züricher Puppentheater. 1998 - Performed poetry at the United Nations’ Conference ECA celebrating African Women in Addis Abbaba, Ethiopia. 1998 - Doing Peter and the Wolf with the Durban Synfonic Orchestra. 1998 - Performing Africa at the Opera with the Francis Bebe Quartet and Ladysmith Black Mambazo at the Köln Philharmonie and other Opera Houses in Germany. 1998 - Touring in the North of Germany for the Schleswig Holtstein Kindertheater-Festival. 1998 - Participated in an intensive musical workshop in Senegal’s Goree Island at the Goree Institute, with many African musicians from different African countries. 1999 - Toures 26 schools telling stories and running story creation workshops in the Schlesvic Holtstein region in North Germany. 1999 - Ran a two week master class on the Art of Storytelling and Story Creation as part of Das Arts School of the Arts in Amsterdam, Holland. 1999 - Wrote stories and music for musical storytelling show WAVES & TALES at Durban’s Playhouse Theatre with guitarist Bheki Khoza. 1999 - Was one of the top performers at the GRAZ International Storytelling Festival in Austria. 1999 - MC and performer at the Wuerzburg Africa Festival in Germany, the focus country was South Africa. 1999 - Took WAVES and TALES to the USA and performed to a highly enthusiastic audience at the Kennedy Centre in Washington DC. 1999 - Was awarded the ARTS and CULTURE HERITAGE AWARD for preserving the art and heritage of African Storytelling. 1999 - Wrote and directed a family musical play, Mata- Mata at Durban’s Playhouse Theatre, (I wrote both music and script). 2. UKhozi FM (Radio Zulu) both sponsored by the JOKO Storytelling Project. 2000 - Wrote and presented story for Animated Taled of the World Project, and then Co – wrote the script of same story How Tortoise Won Respect for animated film by Right Angle TV (England) in collaboration with SABC Education. Also wrote and recorded music for the same film with musicians Pops Mohamed and Bheki Khoza. 2000 - Represented South Africa at the Hannover Expo, Germany. 2000 - Touring RSA with the Million Books Project. 2001 and 2002 - Nozincwadi Literacy Campaign – touring rural areas in South Africa Promoting the importance of reading and starting school library boxes. A CD was also recorded with music, stories and poetry with the strong reading message for young people. Every school visited received a large box full of books for their library. 2003 - Story telling tour of Germany, France, Italy, Belgium, Austria. 2003 - Writer’s residency at the Isabella Stewart Gardner Museum, Boston USA. 2004 - Visiting Lecturer to conduct Storytelling Workshop with second year drama students at University of Cape Town. 2004 - Visiting schools and universities in Brazil on the invitation of the RSA High Commissioner, Sao Paulo. 2004 - Participating in the hosting of iBbY Congress in South Africa. 2004 - Italian tour to promote Le Story de Mazanendaba. 2004 - Touring the UK for the promotion of South African literature as part of the celebration of Ten Years of Democracy. 2006 - Gcina represented South Africa at the FIFA World Cup in Germany and performed at the South African World Cup Logo Reveal, a performance that was broadcast to billions of Television viewer around the world. 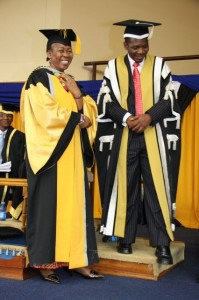 2008 - received Honorary Doctorates for Literature and Contribution to Africa’s Cultural Heritage from University of Pretoria and from Fort hare University. Again on the same year she received the Prestige Award from CITY Press and RAPPORT newspapers for excellence in her field. 2008 - Nozincwadi work grew to host the First Storytelling Festival, celebrating Books and Stories. 2009 the Festival was again a great success! 2009 - Gcina travelled to Germany and Greenland to perform with an all woman cast HOUSE OF SONG and HOPE she wrote the script and music. Same year she stayed on and created a new Workshop Theatre Piece with Greenlandic performers, Travelling Song, a partnership that will be performed at the Vancouver Arctic Winter Games in March 2010. In all she does, Gcina continues to fly South Africa’s flag with pride. 2010 - Launch of Songs and Stories of Africa CD in isiZulu and isiXhosa. 2010 - Gcina represented South Africa in Egypt for the Celebration of African Cultures. 2010 - Stories of Africa also came out in Portuguese in South America. 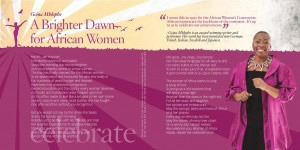 2010 - African Mother Christmas CD released. 2011 - Jaipur Literature Festival in India, where she received great appreciation for her books as well as storytelling performances. 2011 - Manila, Philippines, as guest of the SA Embassy: Moonlight Magic a storytelling show which was very well received. She also ran Master Classes for Teachers and Librarians. 2011 - Singapore, Hosted by the National Museum as part of the CONGO Mask Exhibition.